Imagine that you design some special reports specifically for your sales team and you want to make sure that these report selections appear just for them. Likewise, you may not want to show your Research department those sales reports. You can do this by telling Quick Base which reports appear as options for each role. Note: If you embed a report on your app Home page, all roles see the report regardless of any other settings you make. When you assign a report to a role, the report appears for users in that role. The goal is to provide users with shortcuts to reports that are helpful to them and others in their role. Assigning a report to one role does NOT mean that users in other roles can't access the data in that report. Sure, users in other roles may not see the report you create, but they can still craft it themselves or find the values in the report by searching for the values they want. This feature does NOT hide or protect sensitive data. If you need to secure data, set up access permissions instead. Specify which roles see a report when you save the report in the Report Builder. 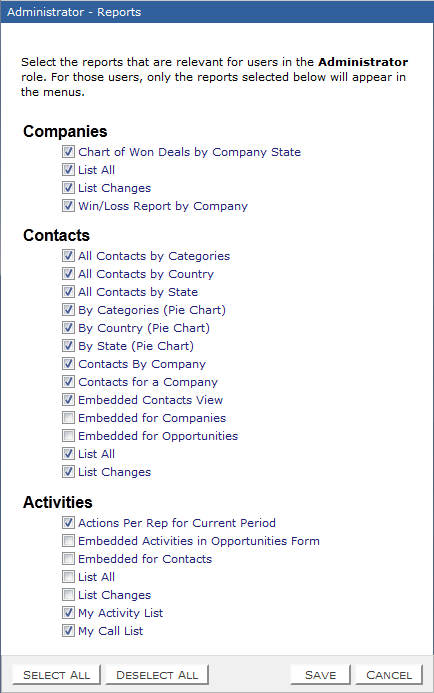 Handle all reports and roles at once from the Roles and Reports Matrix page. Specify the list of reports for a single role when you create or customize the role. You can assign a report to a role when you save or edit the report, or assign multiple roles to multiple reports at the same time using the Roles and Reports Matrix page. All. To share with everyone who can access the application. My role only. Select this option and Quick Base displays the name of your Role. Only viewers in that role will see the report on the reports and charts panel. Users in specific roles. When you make this choice, Quick Base displays checkboxes for each role. Select the checkbox next to each role that should see the report on the reports panel. No one. The report will not be displayed in the reports and charts panel. Note: Admins can still go to Table Settings to see the report. Users in specific roles. When you make this choice, Quick Base displays checkboxes for each role. If you chose My role only when creating the report, the checkboxes corresponding to your roles at the time will be selected. Choose Home from the Table bar, click SETTINGS, click Roles, then click the Set role access to Reports link. Note: Users who do not have Full Administration access to the app (usually app admins and app managers) cannot access this page. Quick Base displays a list of all your application's reports. On the right, are columns—one for each role. To specify which report should appear to a particular role, locate the report in the list. Within each role's column, specify whether or not the role should see the report in the reports panel. To have the report appear to the role, activate the check in that role's column. To hide the name of the report from a role, deactivate the check in the role's column. Your changes are saved as you work. Tip: If you have a lot of roles, columns may stretch far to the right of the screen, making it hard to keep track of which reports you're activating for roles on the far right. When you need to scroll right, the Table and Report columns remain visible on the left. Choose Home from the Table bar, click SETTINGS, then click Roles. Click one of the roles. Click the User Interface tab. Click the Set report access link. Select the checkboxes next to each report you want the role to see in the reports panel. There is a way to hide a report from all roles, until you choose to show it using the Set report access link or the Set role access to reports link (both methods described above). Create or edit a report. In the Basics section of the Report Builder, select Temporarily hide this report. When you save the report, it will not appear in the reports panel for any role until you choose to show it using one of the methods described above. The hidden report will appear in the Manage Reports page (which lists all reports in the app) and the Reports & charts page (which lists all reports for the table). If you copy a report that has been hidden in this way, the copy will also be hidden. But if you customize the hidden report and save it under another name, the new report will not be hidden.